The “Water Statesperson of the Year” award recipient is selected for outstanding achievements in building alliances in the RWA service area. The awardee(s) can be from any profession or employment, and need not be an RWA member/participant. This award is intended to recognize specific “timely achievements” during the award year. This award was established in 2001. Ryan Bezerra, a partner with the firm Bartkiewicz, Kronick and Shanahan accepts the Water Statesperson of the Year Award. 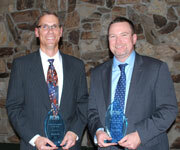 Jim Peifer, Senior Engineer for the City of Sacramento; and Andy Fecko, Director of Resource Development for the Placer County Water Agency, received the Water Statesperson of the Year Award. Debra Sedwick, General Manager of the Del Paso Manor Water District, received the Water Statesperson of the Year Award. 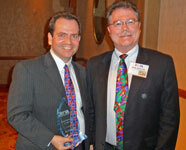 Tom Gohring, Executive Director of the Water Forum, received the Water Statesperson of the Year Award. Sean Bigley, Government Relations Analyst for the City of Roseville; and Rob Swartz RWA’s Manager of Technical Services accept the Water Statesperson of the Year Award. Einar Maisch, Director of Strategic Affairs from the Placer County Water Agency, accepts the Water Statesperson of the Year Award. Lisa Brown, Water Efficiency Administrator for the City of Roseville, accepts the Water Statesperson of the Year Award. Ryan Bezerra, a partner with the firm Bartkiewicz, Kronick and Shanahan accepts the Water Statesperson of the Year Award for 2009. 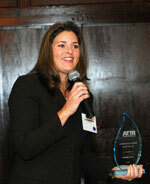 Shauna Lorance, San Juan Water District General Manager accepts the Water Statesperson of the Year Award for 2008. 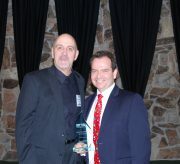 Steven Nugent, Carmichael Water District General Manager and Rob Roscoe, Sacramento Suburban Water District General Manager accept the Water Statesperson of the Year Award for 2007. Pauline Roccucci, former director for the Placer County Water Agency, receives the Water Statesperson of the Year Award. James McCormack, retired from the Sacramento Water Forum, receives the Water Statesperson of the Year Award. Stephen Hall, executive director of the Association of California Water Agencies (ACWA) and Paul Bartkiewicz, attorney with Bartkiewicz, Kronick and Shanahan accept the Water Statesperson of the Year Award for 2005. Derrick Whitehead, environmental utilities director of the City of Roseville receives the Water Statesperson of the Year Award for 2004. Dave Breninger, general manager of the Placer County Water Agency (left) receives the Water Statesperson of the Year Award from Rich Plecker, general manager, Fair Oaks Water District. John Woodling, chief of the Conjunctive Water Management Branch of the Department of Water Resources (left), Vanessa Nishikawa, supervising engineer, Montgomery Watson Harza, and Ed Winkler, RWA Executive Director receive the Water Statesperson of the Year Award. Rich Plecker, general manager of the Fair Oaks Water District was selected as the first recipient of the Water Statesperson of the Year Award.